At first glance, Bangkok’s sheer size and gridlocked traffic can make getting around seem impossible. Thankfully, the city’s wide range of transportation options – from the BTS Skytrain to river boats and motorcycle taxis – make getting around easy. 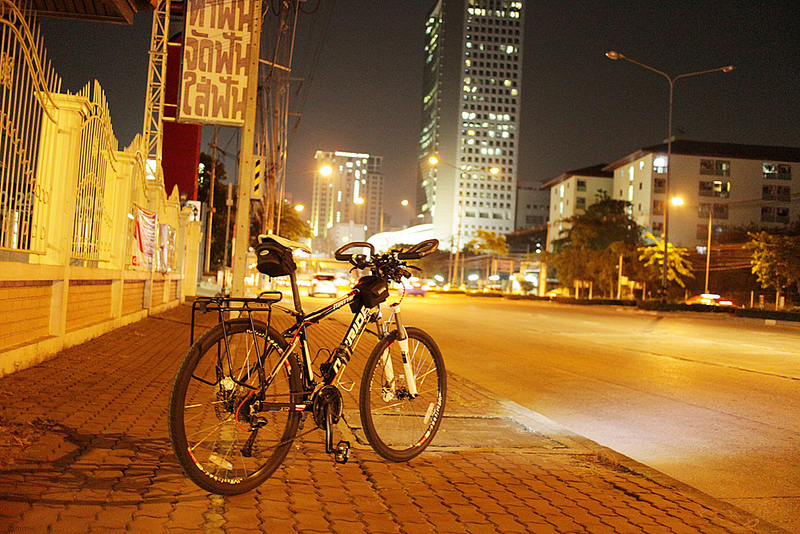 Bangkok is a huge city, and the best mode of transportation will depend on where you’re located. Getting around Bangkok is easy if you understand know where you want to go and which transport options are available in your area. 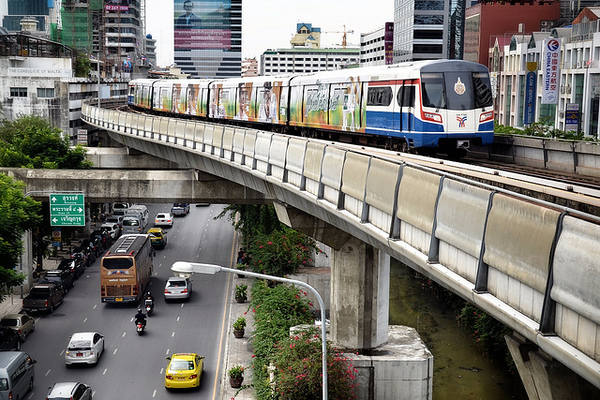 The BTS Skytrain is the quickest and easiest way to get around central Bangkok. It runs on two lines – the Sukhumvit Line and Silom Line – linking Bangkok’s central business districts and covering almost all of the central city. If you’re staying in Sukhumvit or Silom, the BTS will help you avoid the city’s traffic jams and get from one point to another quickly at a low cost. Tickets start from 15 baht a trip – check the BTS price table for more information. It’s important to note that the BTS does not cover the Rattanakosin area. If you’re staying around Khao San Road, you’ll need to take a taxi or boat to Saphan Taksin Station, where you can connect to the BTS Silom Line and get around the city. 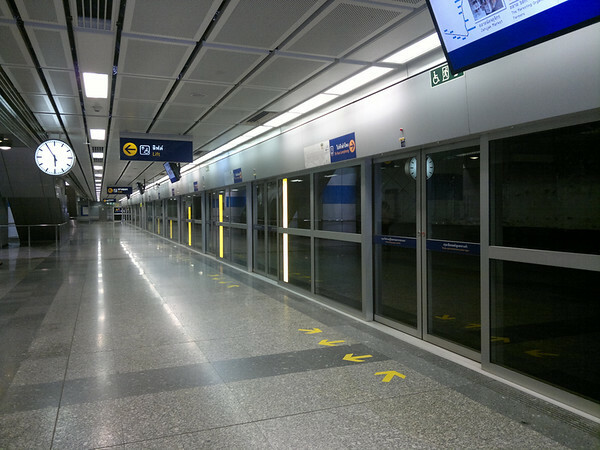 Completed in 2004, the MRT is Bangkok’s second mass transit system. 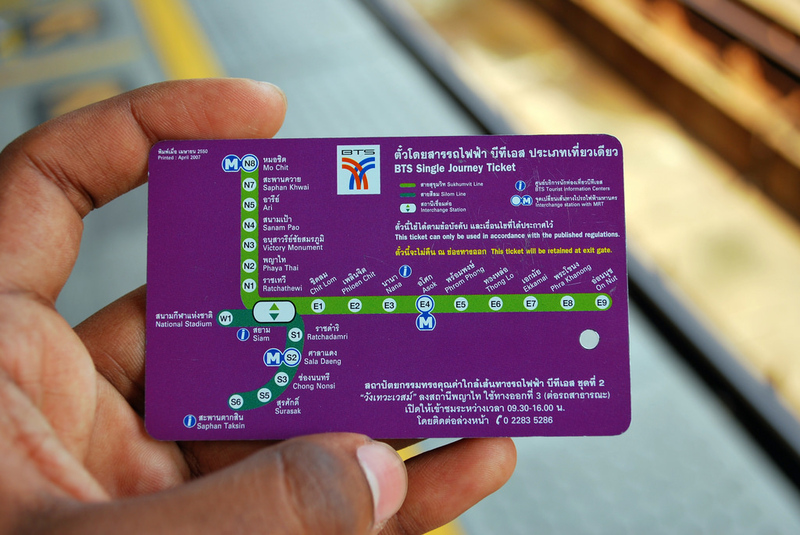 It covers the northern section of Bangkok and connects with the BTS at Asok (MRT: Sukhumvit), Sala Daeng (MRT: Si Lom) and Mo Chit (MRT: Chatuchak Park) stations. The MRT is the most convenient transport option if you’re staying in the northern section of the city. It has a station inside Chatuchak Market (Kamphaeng Phet) and connects to Bangkok’s central train station at Hua Lamphong. Like the BTS, the MRT doesn’t cover the Rattanakosin area. Tickets for the MRT are sold separately from the BTS, so if you’re travelling using a Rabbit Card you’ll need to purchase a separate ticket from the MRT station. Bangkok might be infamous for its traffic jams, but getting around by taxi can be a surprisingly fast and cheap way to travel through the city, provided you choose the right time to travel. Most taxi drivers in Bangkok won’t speak English, so make sure you write down the name of your destination (your hotel’s staff can help with this) before you go. Avoid taking the taxi during the morning and evening if you’re located close to the BTS. Make sure your taxi driver agrees to use the meter – if he doesn’t, it’s worth waiting for another taxi. Avoid using taxis parked outside hotels and tourist attractions as they’ll often refuse to turn on their meters and instead quote inflated fares. 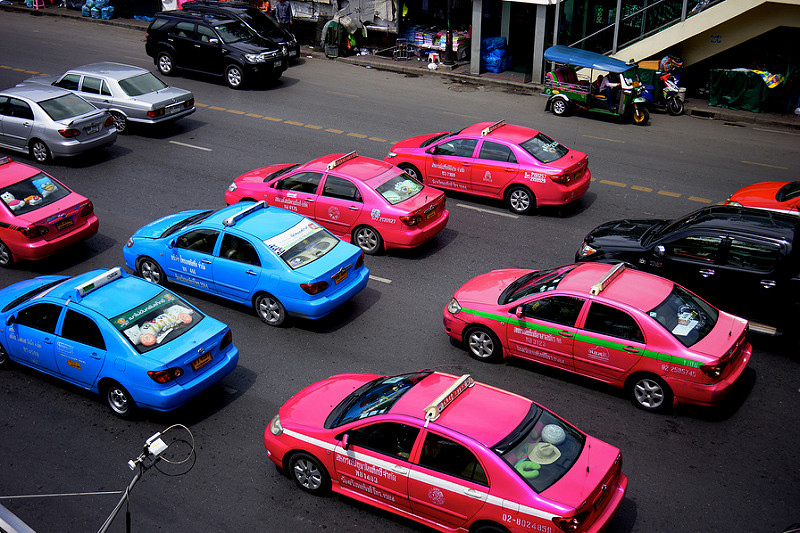 Bangkok taxis start from 35 baht and are easy to find anywhere in the city. If you’re located in the central city, you can use GrabTaxi to call a public taxi or Uber to travel around Bangkok in a private car. Motorcycle taxis are a quick and convenient option for travelling short distances in Bangkok. They’re usually located near BTS and MRT stations and outside shopping malls and attractions – look for a people wearing orange, purple or green vests. Bangkok’s motorcycle taxis aren’t metered, so you’ll need to agree on a fare before you depart. Some motorcycle taxi stations will have a fare board with destinations and prices, although most will only list destinations in Thai. If you need to travel more than one kilometre, a taxi will normally be safer and more cost effective than a motorcycle taxi. For short distances, motorcycle taxis are a fast, albeit potentially hazardous, way to get around the city. Bangkok’s tuk tuks might be iconic, but they’re generally best avoided unless you have no other options. Loud, uncomfortable and infamous for aggressive pricing, they’re a fun experience once or twice but not a reliable transportation option. 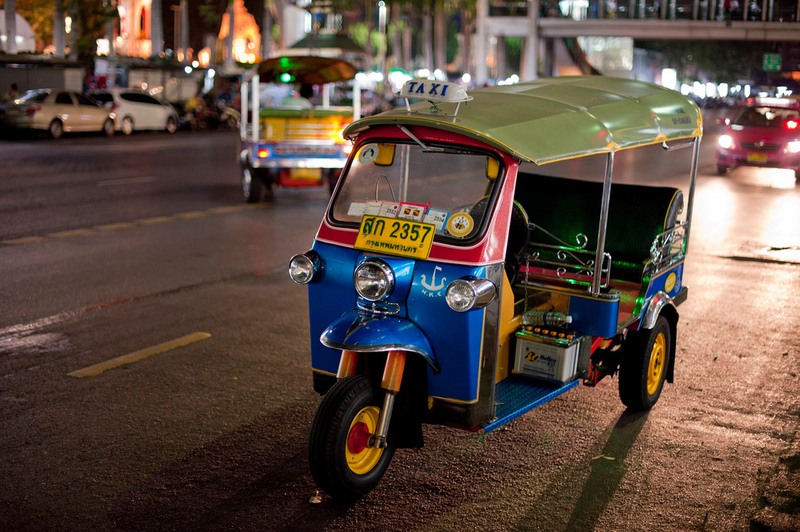 Tuk tuks are infamous for quoting massively inflated prices, so make sure you’re aware of how far your travelling and the equivalent price for a meter taxi if you choose to take a tuk tuk. Always negotiate the fare before you get in the tuk tuk. While riding in a tuk tuk can be a fun experience, they’re not regarded as the most reliable transport option in Bangkok. Unless you have no other options, it’s almost always safer, cheaper and easier to just take a metered taxi. Bangkok has an extensive canal network that, although far from clean, is one of the quickest ways to get around the city. Boats run along the city’s major canals, as well as the Chao Phraya River, making it easy to avoid the city’s infamous traffic jams. If you’re visiting Wat Pho, the Grand Palace or any other riverside attractions, step aboard the Chao Phraya Express Boats. Boats depart from Phra Arthit pier (closest to Khao San Road) and the central pier located beside Saphan Taksin BTS Station. If you’re travelling in a group, you can also hire a private river taxi to take you along the Chao Phraya River. River taxis usually charge by the hour – agree to a small fare first and negotiate an hourly rate once you’re on board to avoid paying extra. The Saen Saep Canal (khlong) is Bangkok’s busiest manmade waterway. If you’re staying around Khao San Road, it’s a quick and convenient way to get into the city without taking a taxi or connecting to the BTS at Saphan Taksin. 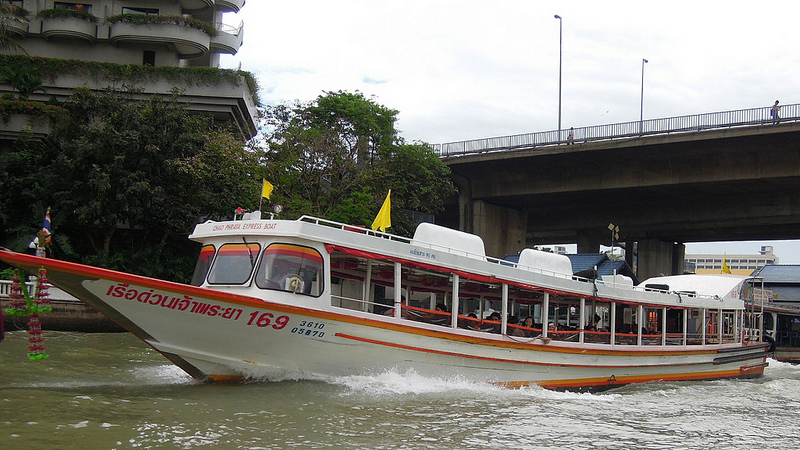 The Saen Saep Express Boat runs from Panfa Leelard pier all the way to Bangkapi in Bangkok’s outer suburbs. Key stops include Pratunam pier (near Bangkok’s biggest wholesale clothes shopping district), Asoke-Petchaburi and Thonglor pier. Getting around Bangkok on foot is possible, especially if you’re staying close to Siam or Chit Lom, where elevated skywalks make it easy to avoid the traffic. However, the city’s sidewalks are not the friendliest and you’ll need to watch out for obstacles. Skywalks connect the major shopping malls in Ratchaprasong, making it easy to get from Siam to Chit Lom on foot. There are also elevated walkways near Asoke station, connecting the BTS to nearby shopping malls and buildings. Getting around Bangkok on foot is a fun way to experience the city, but it’s not the easiest way to get from one point to another. Stick to taxis or the BTS and MRT for long distance travel and walk locally. Bangkok isn’t the world’s most bicycle-friendly city, but it’s getting better with time as bicycles become a more common sight on the streets. If you’re new to Bangkok, a bike tour is a great way to see the sights and learn the city’s layout.